The work that goes into a farm isn't just plowing, planting, watering and processing, especially for organic farms. Every year there are two certifications at Ayers Creek Farm, one by the government, required for them to use the term "certified organic" on their products, and the other by their customers, a voluntary requirement they've been glad to undergo every year since they began farming. This year's ramble is scheduled for Oct. 12. On the 18th of April our organic certifier visited the Ayers Creek for our annual inspection. Arriving at 9:30, he inspected our farm and our records without pause, finishing his closing interview at 2:15. Even though we have been through the process 15 times since 1999, it remains an intense experience. 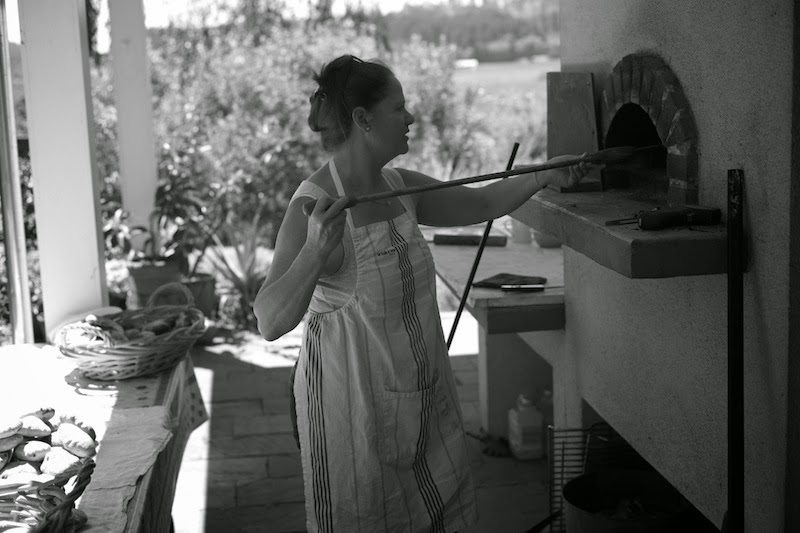 Linda Colwell at the farm's wood oven. The application, submitted in March, articulated our organic farm management plan. After it was reviewed, an inspection was scheduled. The week before inspection, we make sure all of the records, seed packages, certifications and invoices are pulled together. All of the buildings, machines and fields must be open to inspection. 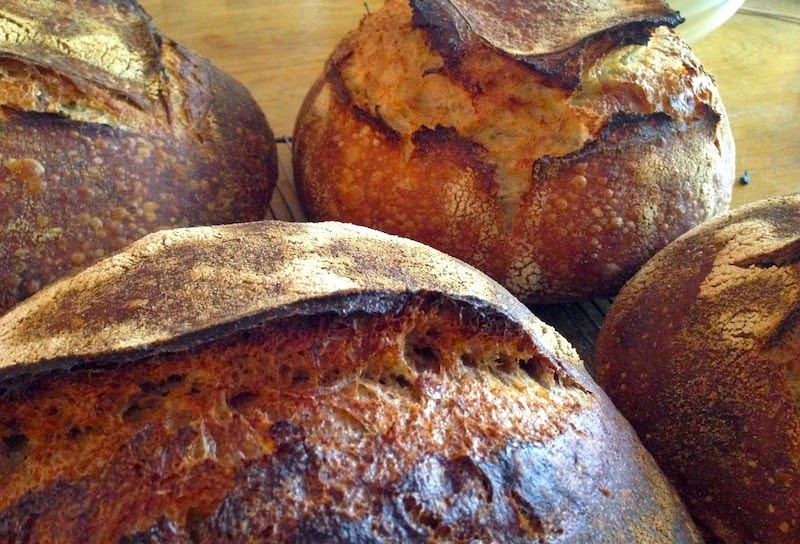 Breads from the wood oven. Passing the review, inspection and audit allows us to carry the term "certified organic" on our labels and signs. Our second very important review and inspection comes when you all visit the farm on the ramble. We take it as seriously, and fret over details the week before. We are cognizant of the fact that if you are not satisfied with the way we farm, we could lose you as a customer. However, this inspection is much more comfortable because we can digress from the topic at hand and digest Linda Colwell's excellent food. This year's ramble will take place on the 12th of October, from 3:00 to 6:00 pm. Bring friends and family, along with sturdy shoes and a bee sting kit if you are allergic. As a reminder, in our irrational New England Blue Law rectitude, we have kept the ramble strictly noncommercial. We won't be selling anything. Please don't try to lead us astray, just enjoy the stay. Black and white photos by Anthony Boutard. Click on them to get enlarged versions—they're worth it! When we moved to Northeast Portland it wasn't unusual to have our sleep interrupted by the occasional spurt of gunfire. It wasn't coming from our street, but close enough, within a quarter mile or so, to keep me awake through the inevitable sirens that would follow. Mississippi, Williams and Alberta were streets best avoided after dusk, not just because they were lined with derelict buildings, but the nightlife they attracted back then was of a distinctly shadowy variety. 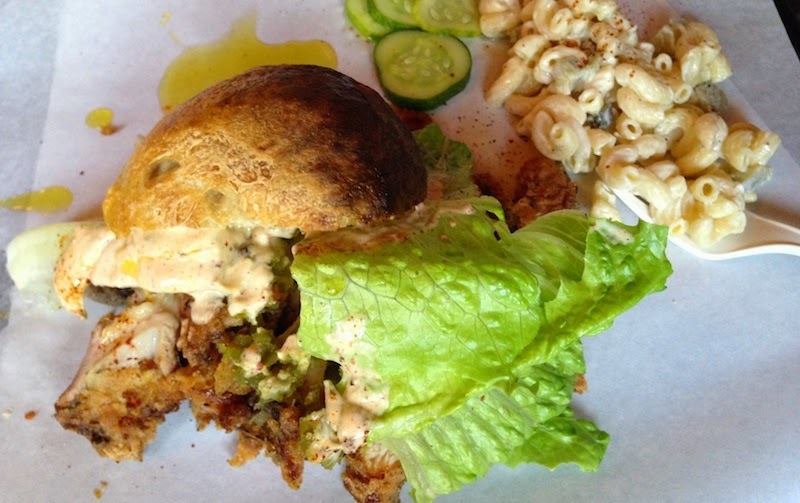 Fried chicken sandwich, mac salad. That's all changed now, of course; our sleep is much more likely to be interrupted by a dog barking at the neighbor's cat or a passing squirrel. The derelict buildings have been repopulated with trendy shops and bars, or torn down altogether to make giant condo developments. Expensive city bikes have replaced the broken-down cars that used to cruise the avenues. Last year Ms. Parker decided to retire from the business she'd owned for more than 55 years. Which was fortunate for Cliff Allen, who'd been looking for a brick-and-mortar location for his People's Pig. They came to an agreement on the condition that he wouldn't change the interior. 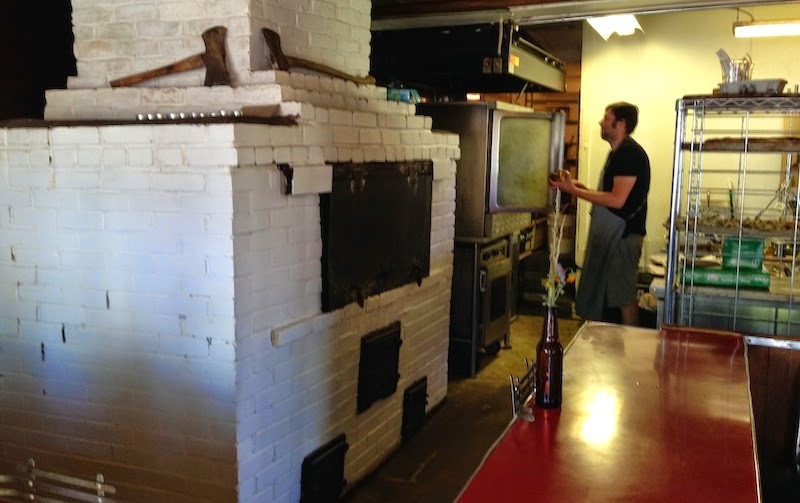 Not that he'd want to, mind you, since its simple counter and row of booths are wrapped around a behemoth brick smoker that Allen says can smoke 300 to 400 pounds of meat at a time. Allen also isn't the type to need some fancy designers to zhoosh his vibe. Like the food he crafts, he likes to keep it simple: deeply smoked fried chicken, smoked pork shoulder and ribs served on parchment paper-lined trays, either piled high (the "plate" version) or almost contained in a hearty roll. Sides are also basic and equally crave-worthy, featuring macaroni salad, potato salad, beans and a slaw. Prices? Also reasonable. The sandwich, for eight bucks, comes with one side, the plate, ten bucks with two sides. The fact that it's walking distance from our house? I'd say the neighborhood just took another major turn toward the positive. Details: The People's Pig, 3217 N Williams Ave. 503-347-2357. In the time since my last post on the bread salad the Italians call "panzanella," I've made at least two different versions of the recipe. As long as the tomatoes are juicy—perfect for those overripe specimens you just couldn't fit on your tomato platter—and the olive oil is plentiful, you're in business. The two versions? Well, considering I have access to a virtually endless supply of bread because of Dave's homemade sourdough habit, we've had bread salad as both a main dish and a side salad. The first version consisted of the basic recipe combined with about a tin's worth of leftover albacore that I'd had the foresight to bag and freeze. 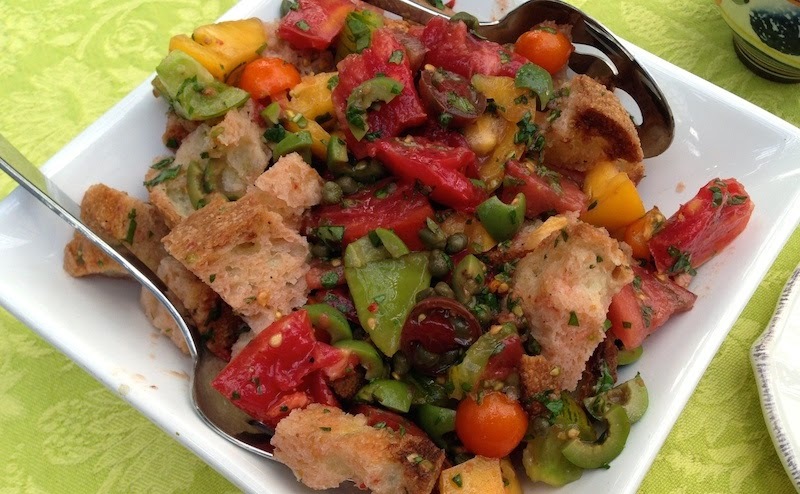 The second was based on a variation of my friend Michel's panzanella (above) that she whipped up for an evening of wine and snacks to celebrate her new job, which eschewed the basil and added capers and chopped castelvetrano olives. Seriously, that's it. As long as the bread has soaked up enough of the tomato juice and dressing, which takes about an hour, it's ready to eat. Talk about fleeting pleasures of late summer…grab a loaf of your favorite bread and as many ripe tomatoes as you can and get to it! 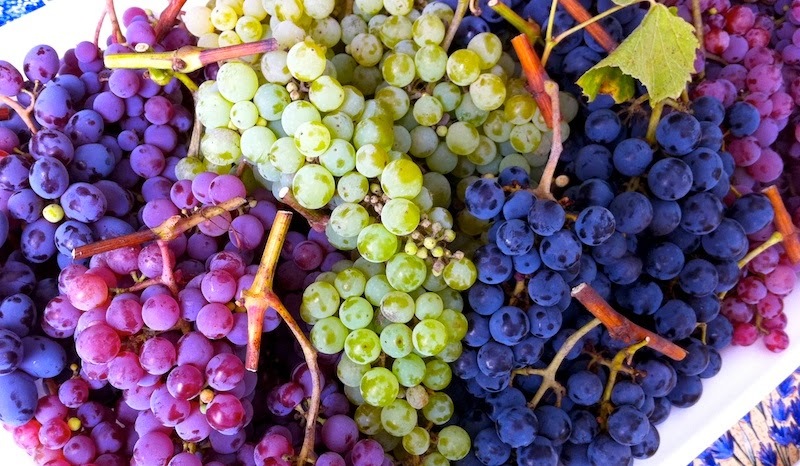 Early fall is a scramble for farmers, vineyards and winemakers, especially this year when the weather has been hot and dry for most of the summer with very few cool days to slow things down. Many crops that would normally be harvested in succession over weeks or months are ripening all at once, multiplying the workload and making the days long. Contributor Anthony Boutard of Ayers Creek Farm has even found a theme song appropriate to the situation in which he finds himself. The hillside wineries were aglow Monday evening as we made our way back from Elmira. They were scrambling to bring in and de-stem their grapes. We were bitten by the frenzy as well. Our freezers were full with no room for the autumn fruits such as prune, damson and grape, so we had to shift some fruit to Sweet Creek's big freezer. Unsure as to how much rain we would see, we harvested a large amount Wednesday, and Thursday we were filling the freezers with plums and grapes. It took six of us about six hours to pit and de-stem the fruit. This year, the fruit is coming on very fast, and there is no room for a leisurely process. The Veepie grapes and damsons were at their very best and we are looking forward to tasting the preserves. We have only a few cases of preserves left, so it was good to fill the freezers for our kitchen time [at Sweet Creek] in late October. Likewise, with the dry beans, almost half have been harvested and cleaned. 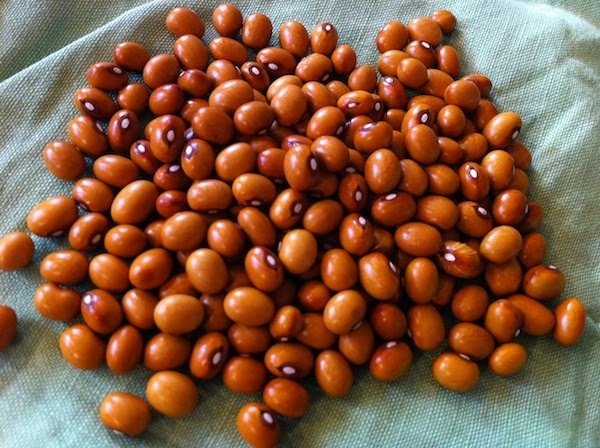 We will have Borlotti Gaston and Purgatorios at market this week, along with chickpeas. Next week, we will have zolfinos and Dutch bullets. Although they mature and dry in the field, we always leave them on screen for a few days until they click brightly when we run our fingers through the tray. At that point, we feel secure bagging them. We will bring favas, popcorn, cornmeal, frikeh and hulless barley. We also have a luxuriant patch of dill, as well as tomatoes and tomatillos. 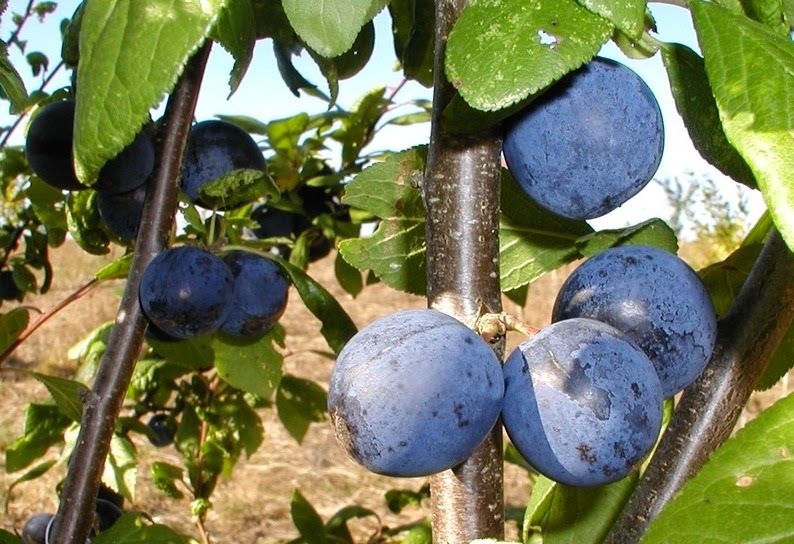 We are also picking prunes for the market, including Pozegaca which is a famous Balkan prune used for slatko and slivovitz. The flavor is sharp and clean. 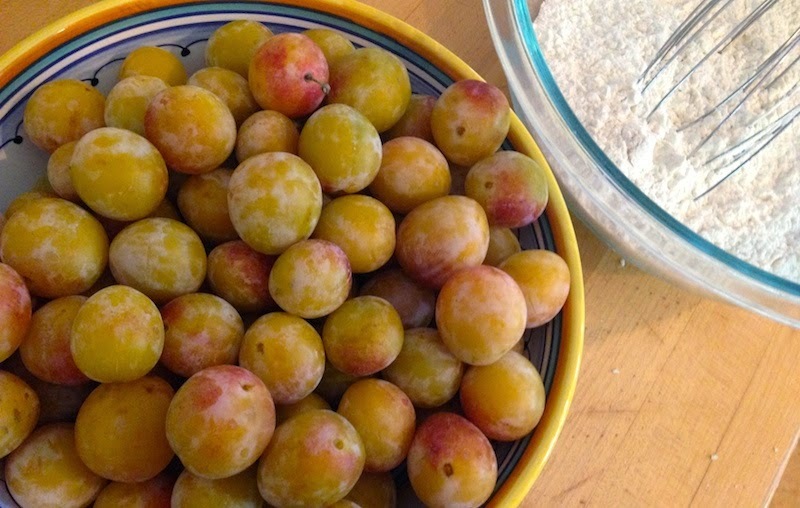 The last of the mirabelles are coming in as well. 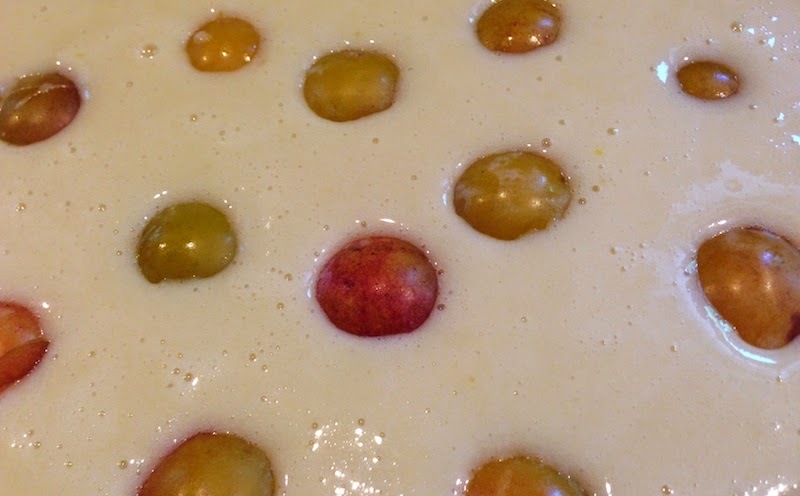 Edward Bunyard's description of Coe's Golden Drop in The Anatomy of Dessert (1929) is unmatched: "At its best, it is a dull yellow green with strong frecklings of crimson, and at its ripest it is drunk rather than eaten; the skin is rather tough but between this and the stone floats an ineffable nectar." We will have just a few, another small bonus granted to us with an early harvest. Friday we pulled the onions and they are curing in the sun for winter storage. Soon the corn will be dry as well. The partnership of Jackie Cain and the late Roy Kral remains an inspiration to us. They approached their craft with confidence and creativity, and on their own terms. Their music was of a kind, built on character rather than formula. Cain died Monday [The New York Times obit.]. If you get a chance, take a moment reach out into a cloud and listen to her. Maybe Sondheim's "The God-Why-Don't-You-Love-Me Blues," summing up what one of us was suffering last week. Plum/prune photos by Anthony Boutard. Friend: "Maybe we should do wine rather than drinks. Might be past margarita season." Me: "What??? Past margarita season? Nevah!" Friend: "OK. You convinced me. There’s a new bottle of tequila in the freezer…"
And with that, the clouds parted, the sun came out and our evening on her deck (with margaritas) was saved. Hallelujah. 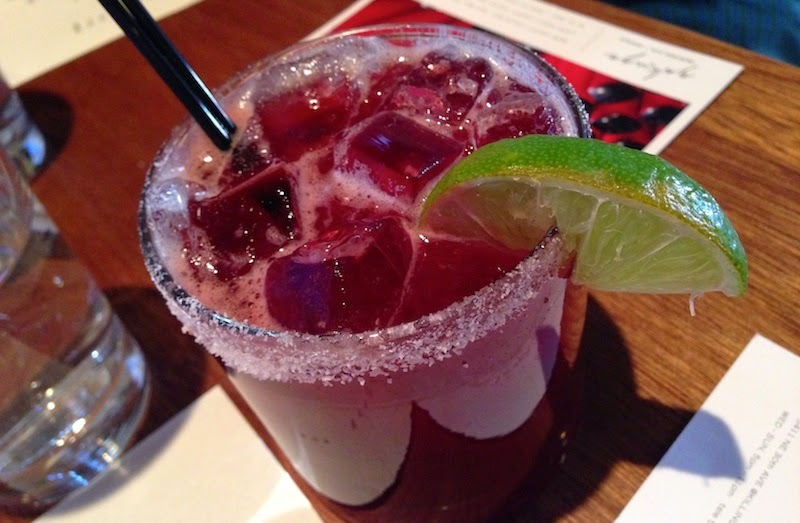 I first had a beet margarita, oddly enough, at Dayna McErlean's Yakuza. Known for its Asian-influenced cuisine, it might seem counterintuitive to feature a traditional Mexican cocktail on the bar menu, but this beet-infused version paired quite well with its Asian flavors and ingredients. Yakuza serves it on the rocks; I prefer mine up in a martini glass. Whichever way you go, its spectacular deep ruby color will garner oohs and aahs, and the bright flavor will complement just about anything—and, for me, any kind of weather—you choose to serve it with. Peel and slice beets. The thinner the slices, the better the infusion. Put the beets in a large non-reactive bowl or glass container and pour tequila over them. Cover the container and refrigerate for about a week. If you choose to make a salt rim on the glasses, take a wedge of lime and slice it once crosswise through the flesh, stopping before piercing the peel. Put the cut wedge over the rim of the glass and run it around the edge. This gives the salt a wet surface to stick to. Pour a mound of salt onto a plate and, holding the glass at an angle, push the rim into the mound and twirl the glass to coat the rim. Fill cocktail shaker half full of ice. Add tequila, lime juice, simple syrup and triple sec and shake well. Strain into chilled martini or, if serving on ice, a rocks glass. Float lime slice on top or squeeze a wedge and drop into the glass. I love a good grain salad, so when I heard Anthony Boutard of Ayers Creek Farm waxing poetic about the quality of their barley this year, I had to get some. 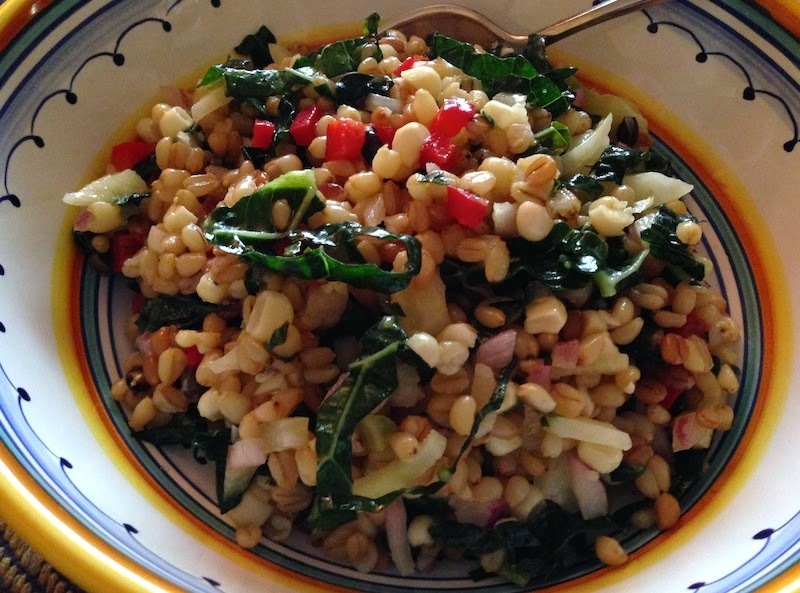 Of course, I'd never cooked barley before, though I'd made a killer salad with his frikeh, but I decided what the heck, my family will pretty much eat anything with enough garlic and fresh vegetables in it. To up the ante a notch, we had old friends coming over for a grilled salmon dinner, and it seemed like a grain salad with some crunchy raw vegetables would be a good match. Adding water to the soaked grains. Between the terrific salmon, which Dave grilled to perfection, and the 2009 Seufert Zenith Vineyard Pinot Noir my brother supplied to go with it, not to mention the near-perfect late Oregon summer evening and the table lit by candlelight, we all were swooning. The pop of the grain and its sweet, carrot-like flavor just made it all that much better. I don't think you could ask much more of a salad. Put barley in large pot. Cover with cold water by 2” and soak overnight. The next day, drain and rinse the barley in a fine mesh sieve. Put in pot and cover with cold water by 1”. Bring to a boil, reduce heat and simmer for 25-40 min. until done to your liking. (I like it a bit al dente, so only cooked mine 25 min.) Add more water if it gets dry. 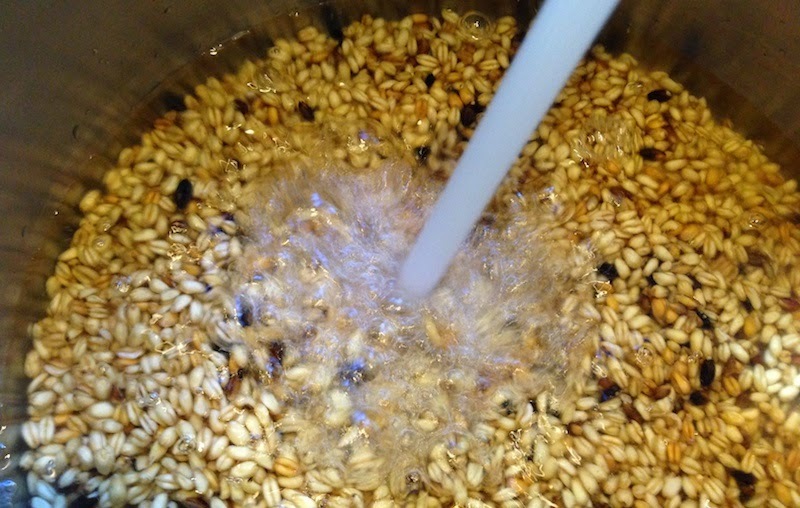 When done, drain barley and rinse in cold water. Put in large salad bowl. Add bell pepper, onion, fennel, corn and kale and mix to combine. Add olive oil, lemon juice and salt. Mix to combine. Cover and place in refrigerator for a minimum of 30 min. before serving. Prior to serving, taste for salt and adjust as needed. 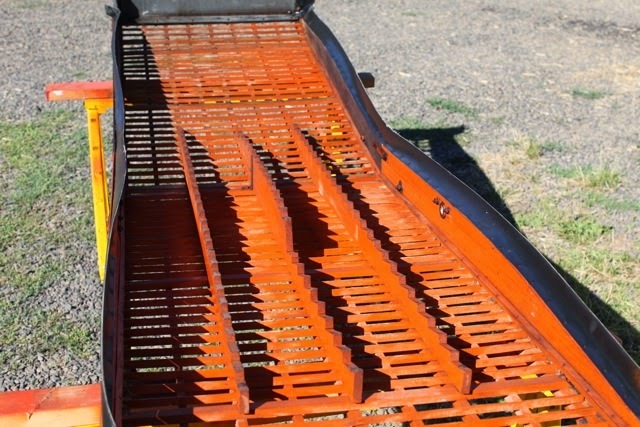 The right piece of farm equipment can make a huge difference in the workload on a farm. 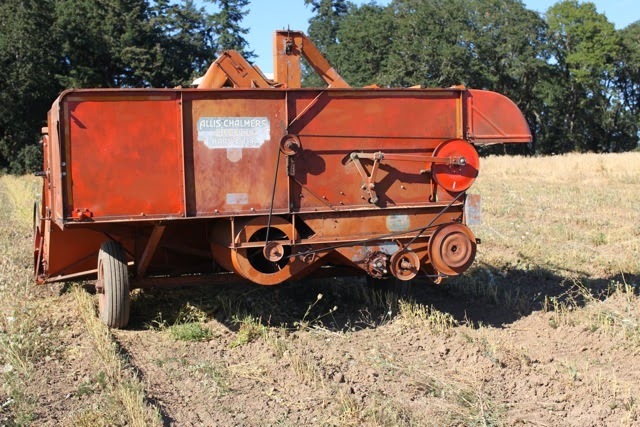 Modern farm equipment is expensive to buy and operate and is often too large to nimbly negotiate the tighter confines of small farms, whereas older equipment was designed for just that sort of use. Contibutor Anthony Boutard of Ayers Creek Farm brings an old but still useful piece of small farm history back to life. Michael Abelman and his son Aaron stopped by Ayers Creek for a few days in late July 2004 as part of his Fields of Plenty project. Rereading the profile a decade later, it is striking how much things have changed, though fundamentally we are the same farm. The profile celebrated the summer here, but we already had one winter market season under our belt. That spring we learned that the combination of spring break, Easter and Passover can kill a market. Lowest gross we have ever had; when vendors leave their cash box unattended there is not much to say for the day. Also learned that we should grow horseradish. Somehow, black radish does not have the same allure as a bitter herb for the seder, much as we tried to laud its many virtues. Our first planting of Roy's Calais flint corn was in the ground, and we were planning our orchard and vineyard. 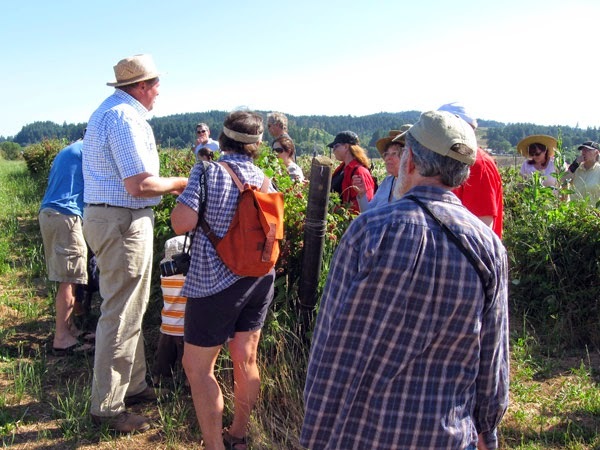 After leaving Gaston, Michael visited Jennifer Greene's Windborne Farm in Scott Valley. There he fell in love with her old Allis Chalmers All Crop. 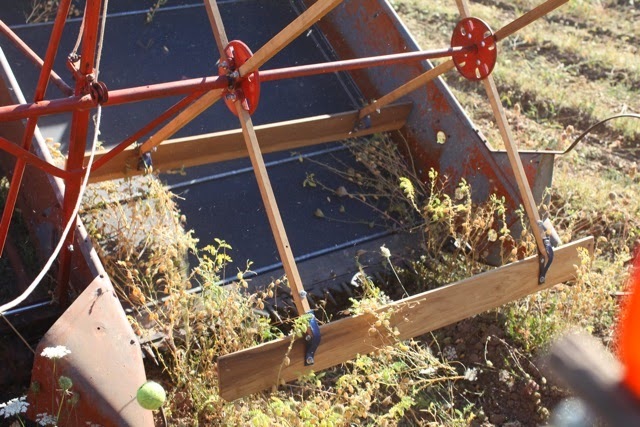 It is a small combine pulled by a farm tractor. A combine gets its name because it combines the formerly separate tasks of cutting, threshing and winnowing seed crops, including legumes and grains. A couple months later he located a pair for sale in Canby, one apparently almost running and a decrepit example for parts. We went to see them with him, and it was clear the rose's bloom was withering as he paced around the two dusty, rusty hunks of machinery with their frayed belts, broken reel bats and rotting tires. We shared his reservations, even as he clung to the memory of Jennifer's machine and all it could do. The challenge of transporting the machines to Foxglove Farm on Salt Spring Island and repairing them dislodged the yearning. Apparently, the pathos of the bedraggled machines and their potential gnawed at us. Not sure what exactly happened to dislodge us from our rational frame of mind, but we purchased them. The machine is boxy with most of its drives on the outside. Like Han Solo's Millennium Falcon, it is meant to be repaired on the fly with materials at hand. Not sleek or elegant, just enough of it to carry out the task well. Perhaps the idea opening up the list of crops we grow had some influence. Other farmers with big machines speak admiringly of the All Crop, with its mixture of flexibility, simplicity and economy. Encouraging the endeavor, not emulating it, mind you. They take their old combines to the Banks demolition derby, not the shop. They are quite comfortable in their modern air-conditioned cabs with stereo and computer controls. In less than an hour, they can harvest more grain than the All Crop can in a day. However, their machines take a full day to clean between crops, and the All Crop is clean and greased in less than an hour. Bullet holes a point of pride. Drawn to the machine, we forgot the first rule of purchasing equipment: turn over the engine to make sure it is operable. Apparently, someone tried to start the engine by using a lot of starter fluid (ether) which cleaned all the oil off the cylinder walls and the engine corroded solid. Neither Marvel Mystery Oil nor grease pumped into the cylinder would dislodge the corroded pistons. Perhaps we would have purchased it anyway, but it threw a disappointing money wrench into the works. The All Crop took a backseat to other projects until our daughter married Jonathan Hunt. In March 2008, he visited and helped strip down the machine. Later he found us an old driveshaft to replace the engine. * Relentlessly, he peeled away the excuses for delaying and pushed us to get it running. 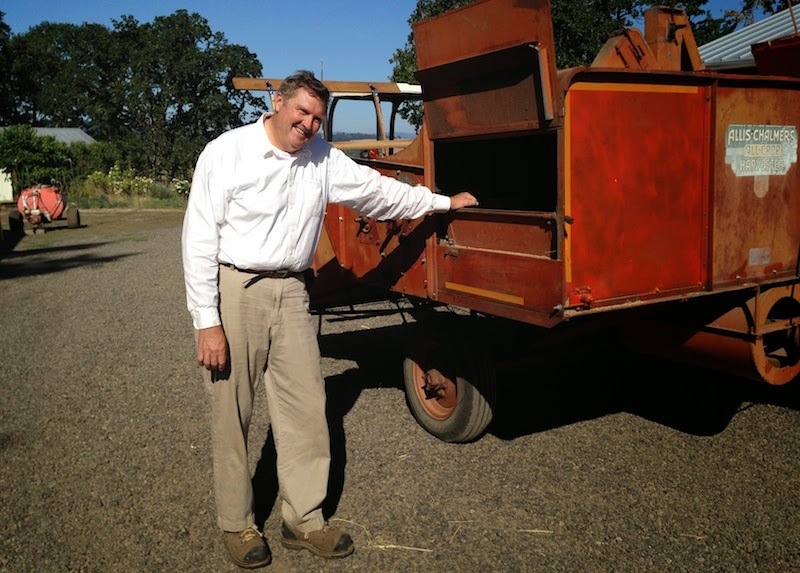 Restoring farm equipment as a show piece is very different from a functional restoration. 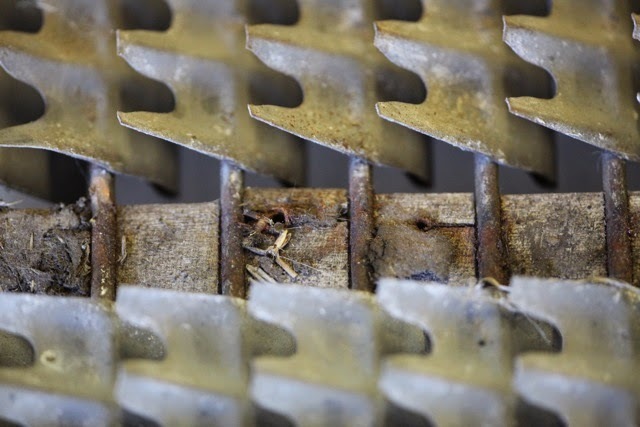 We want the machine to operate for thousands of more hours reliably, so pulleys, shafts and bearings need cleaning and, if necessary, replacing. Rubber and wood parts likewise. Tom Yasnowski specializes in locating or replicating obsolete Allis Chalmers parts, supplying us with the belts and rubber parts that had disintegrated over the decades. The cylinder and concave chamber where the threshing of the seeds takes place needed a complete overhaul. 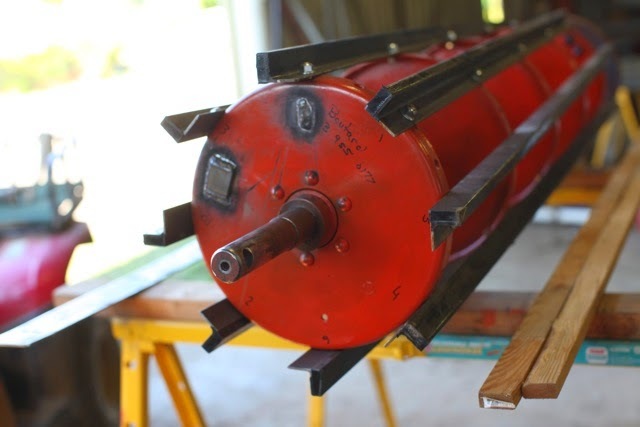 Yasnowski supplied replacement rubber-faced bars for the cylinder and Dave Naumann at Ernst Irrigation in St. Paul helped us locate a shop where the cylinder was balanced. It spins at high speed and, balanced with modern equipment, it runs as smooth as silk. Being an old piece of machinery, we deemed it acceptable to keep the bullet holes that appear when machines are unattended for awhile in rural America. 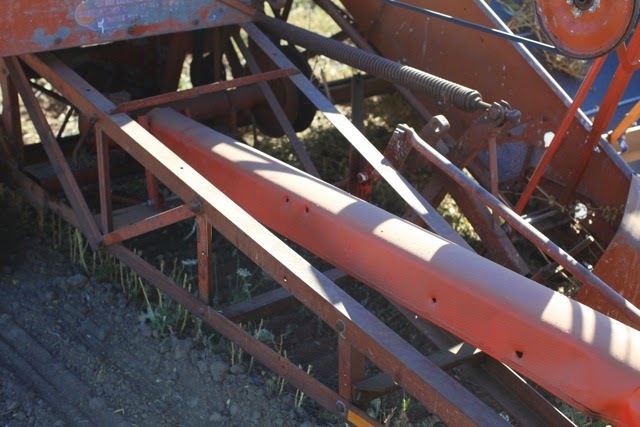 We replaced upwards of 100 corroded bolts holding together the 10-foot-long straw rack, and saturated the dry wood with linseed oil. The adjustable cleaning shoe is where the seed is separated from the chaff, the winnowing task. It had corroded in place making adjustments impossible, requiring several days of careful cleaning and lubrication, and a layer of linseed oil on the wooden parts. 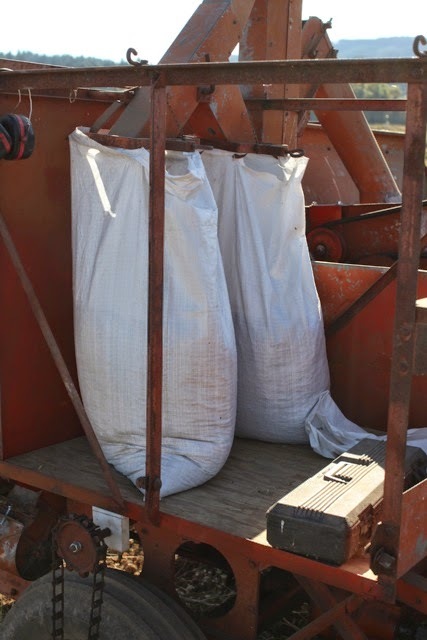 A couple of weeks ago, Jon took his place on the bagger's platform where the seeds drop into sacks. We put in a couple of hours figuring out the fine points of combining chickpeas. As we tried to communicate over the roar of the tractor, the rattling of grain conveying chains and the thrashing cylinder, I might have well have been communicating with a wookiee. It was great to see the patina of a working machine return, that fragrant, short-lived gloss from the resins of the plants. Some of you may have picked up on the fragrance in the barley, and it will be present in the chickpeas as well. There was Queen Ann's Lace growing in the field, giving the grain a hint of wild carrot aroma. Thanks, Jon. * Anthony clarifies that "the machine was equipped with the optional engine or motor. Motor was seized so we replaced it with a drive shaft or PTO (power take off) shaft to run the machine off of the tractor's engine." All photos by Anthony Boutard with the exception of the portrait at top. Making fresh chile verde is a seasonal pleasure, and very simple once you get over the (perceived) hassle of roasting the chiles, especially if you follow contributor Jim Dixon's instructions below. If you get ambitious and decide to roast a bunch of chiles, just bag up the extras and throw 'em in the freezer for posole or enchiladas this winter! Green chile invites controversy, even in its home state of New Mexico (or Colorado, but that's another can of worms). The simplest recipes combine the green chiles (usually roasted, but not always) with onion, cumin and oregano, and use a simple flour roux as a thickener. Some add tomatoes, tomatillos, potatoes or even canned enchilada sauce. Meat usually means pork, but some swear by chicken. And then there's the allegiance to Hatch chiles. Pick a pepper. Roast it. I won't claim my version is anything close to what you'll eat in New Mexico, but it tastes good. There are a lot of chiles grown here in Oregon, and you'll find them now at the farmers market and the better supermarket produce sections. 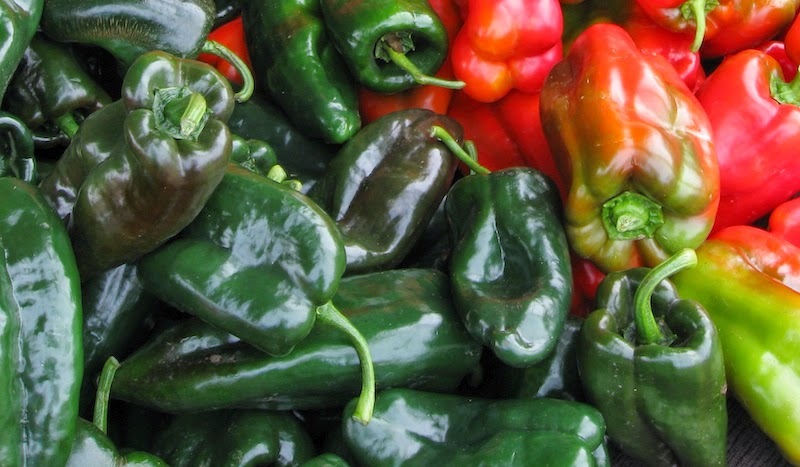 You can usually find poblanos and anaheims if the seasonal New Mexican varieties aren't around. 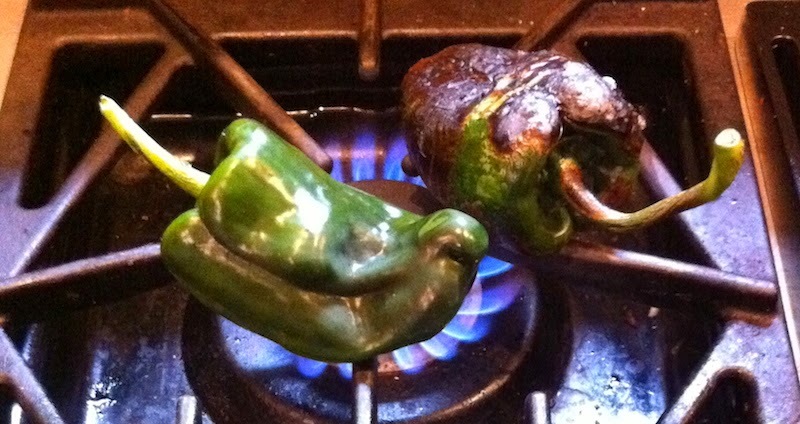 Anaheims are usually mild, but poblanos can vary, so try to taste them first. Start by roasting the chiles. It takes extra time, but getting most of the waxy skin off really improves the final results. 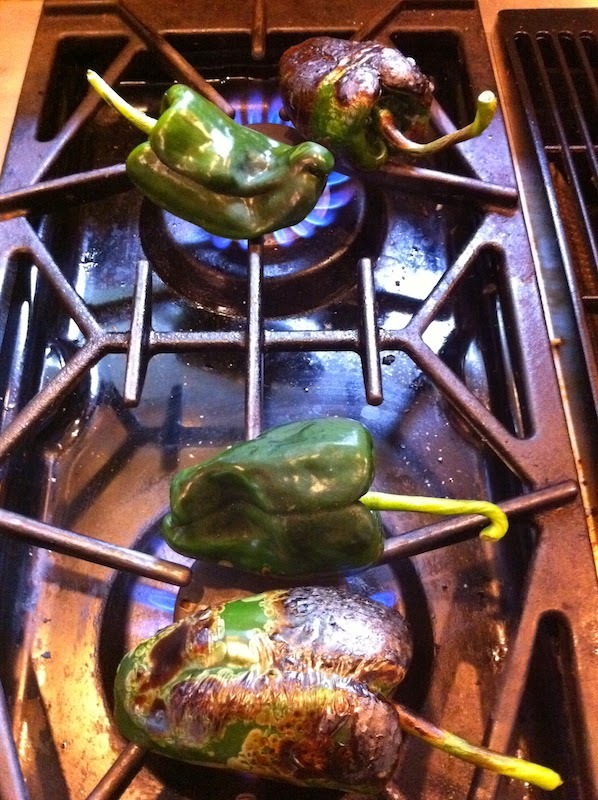 Thin-skinned green chiles are best roasted quickly, and a gas burner works well (I've also used a blow torch, and my very first published story about cooking was about roasting peppers with my old cross country ski waxing torch). If you don't have a gas stove, put them under the broiler, but either way, keep turning them until the chiles are blistered all over, then put them in a covered bowl or plastic bag to steam for a few minutes. Use your fingers to remove as much as of the skin as you can, but it's okay to leave some attached. You can do it under running water, although some claim this removes some of the flavor, too. Roast several at a time. Remove the stem and seed core (a few seeds won't hurt) and chop coarsely. Chop an onion and start cooking it in extra virgin olive oil. Add a half dozen chopped tomatillos (optional, but I like the bright acidity they add), then the chopped chiles. If you want a pork or chicken version, add a pound or so of either, cut into bite-sized pieces (shoulder for pork, thigh meat for chicken are my choices). Add some salt, a teaspoon or more of ground cumin and about the same amount of oregano. Keep it at a lively simmer for about 30 minutes or until the meat is done and the tomatillos have broken down. Sprinkle in a few tablespoons of good cornmeal, preferably Ayers Creek, but that requires a stash in the freezer or a trip to the Hillsdale Farmers Market on a Sunday; for more info, e-mail Anthony Boutard to subscribe to the Ayers Creek newsletter. 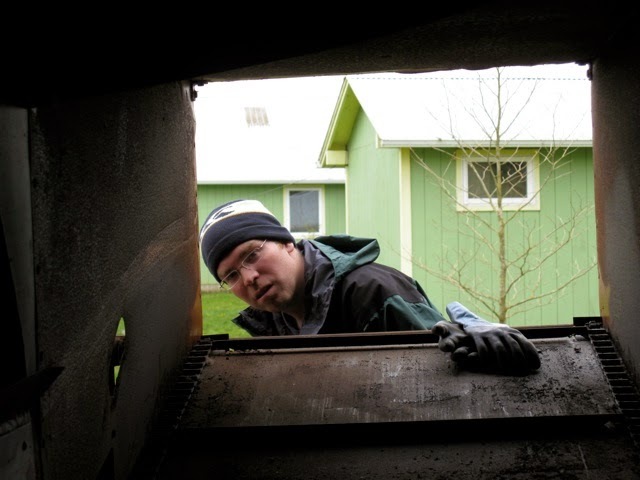 [You can also read his newsletters here at Good Stuff NW under Farm Bulletin. - KB] Reduce the heat to a gentle simmer and cook, stirring frequently, for another 15 minutes or until the sauce has thickened. Eat with a spoon, over scrambled eggs or on a cheeseburger. 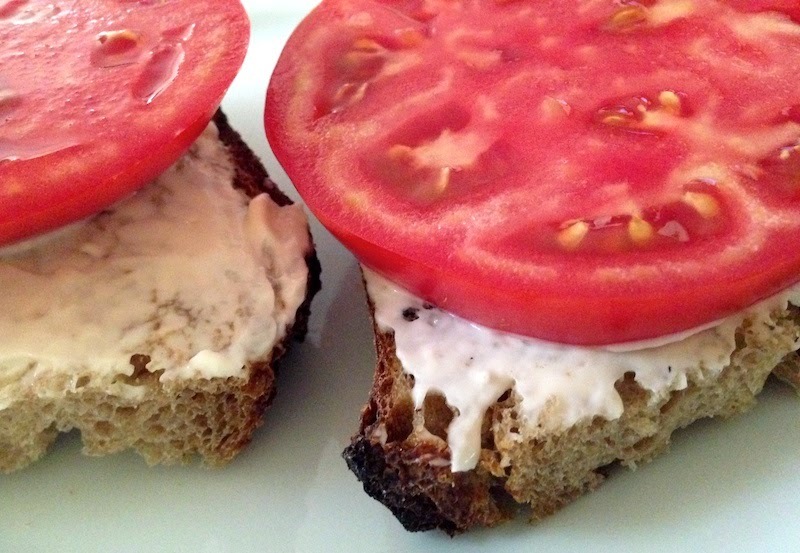 When tomato season rolls around, the first thing I want is a tomato sandwich. Yes, you heard me right, a tomato sandwich. Just thick slices of the nearest perfectly ripe heirloom tomato on some of Dave's homemade bread slathered with mayonnaise. No lettuce or other frippery. I swiftly move on to a BLT with some of Dave's home-smoked bacon, then (in no particular order) tomato salad, maybe a salsa or two or a tomato tart, but tomato season isn't completo without having that heavenly tomato-bread salad the Italians call panzanella. Heaven on whole wheat bread. 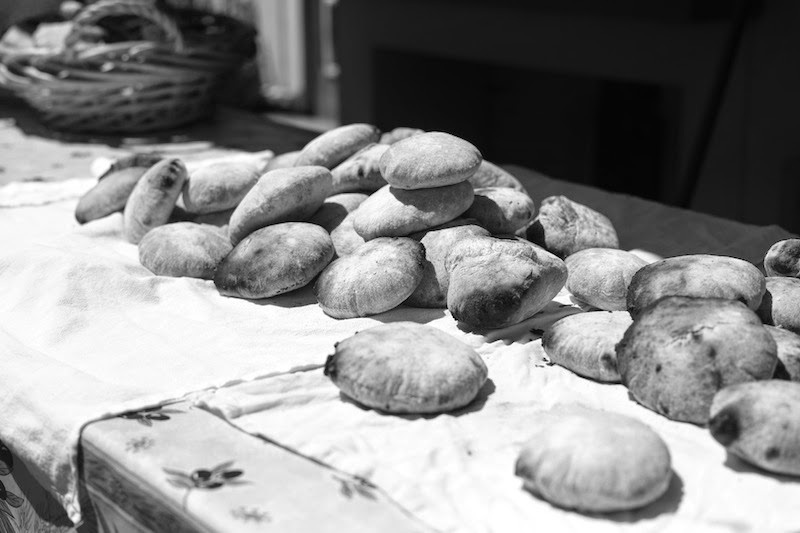 Because of the aforementioned homemade bread, we have lots of loaf ends that get chopped up, dried and frozen, making the ideal medium to soak up the juices from the ripest, sweetest tomatoes. This is the perfect use for those tomatoes that are starting to get a little overripe and squishy, so slice up a mix of those and some ripe-but-firm ones. 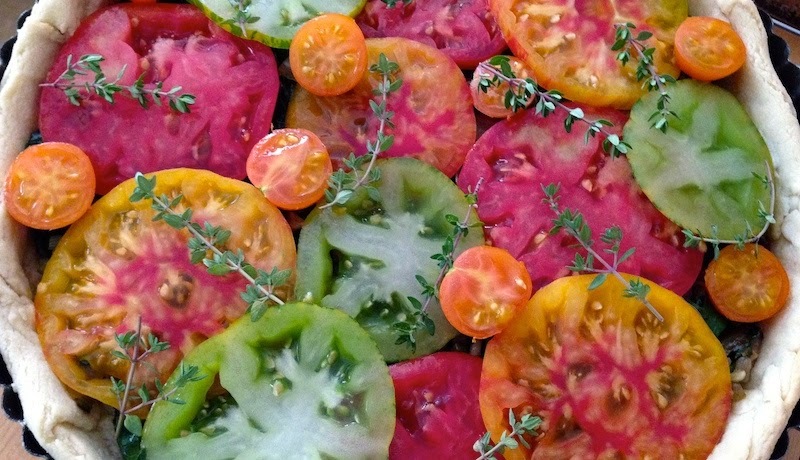 And while it's perfectly fine to just use good old red tomatoes, I like to include as many colors as I can for the most stunning result. It's best to make this a bit ahead of time so the bread has the optimum opportunity to soak up those tomatoey juices, and don't forget to stir it occasionally to rotate the less-soaked pieces into the juice that gathers at the bottom of the bowl. A roasted chicken is my choice to go with this salad if you feel the need for a meat course, but shave some parmesan on top or serve alongside any grilled vegetables for a vegetarian feast fit for a king, or even company! In large salad bowl, combine bread, tomatoes and basil. Allow to stand for 20 min. for bread to absorb juices and dressing. Add remaining ingredients and combine thoroughly. Allow to stand 20-30 minutes before serving, mixing occasionally. 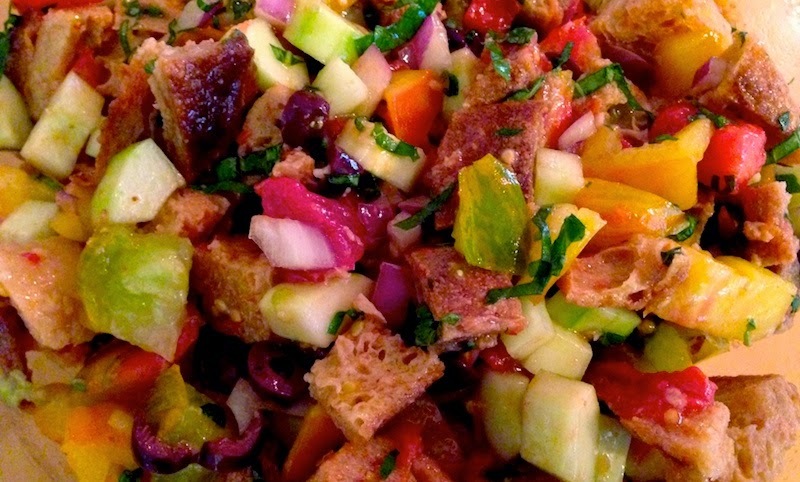 And check out these other versions of panzanella. So infinitely flexible and delicious! 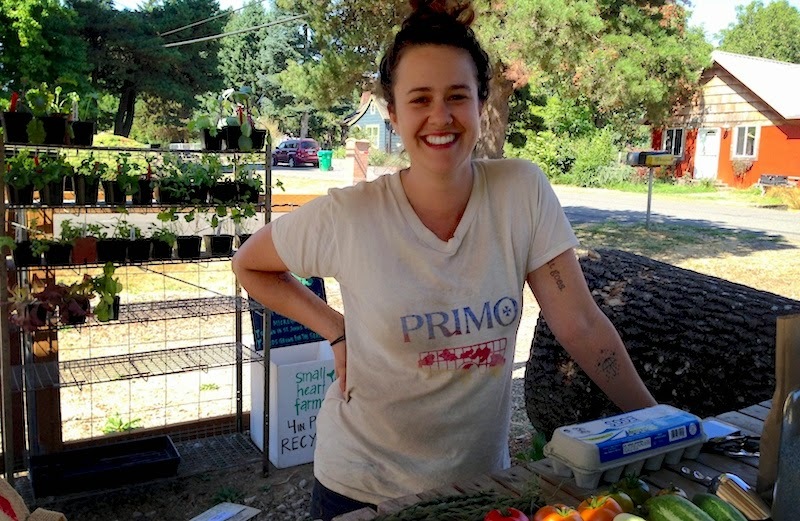 She may not have walls yet, but Nikki Harding (above), does have a toehold in the up-and-coming urban ag scene that is currently taking root in Northeast Portland's Cully neighborhood. The definition of vivacious, she's working to establish a small scale urban farm supply stand providing locally sourced chicken feed, bedding straw and seasonal plant starts and seeds as well as seasonal vegetables from nearby urban farms like The Side Yard Farm and Simpson Street Farm. I'm particularly enamored of the tangerine-yolked eggs she pulls out of the cooler that are on par in flavor, color and richness with the best pastured eggs I've found in town. Small businesses like Nikki's, which include other farm supply stores as well as urban farms growing straw, vegetables and even grains on plots as small as 50-by-100-feet, a plethora of farmers' markets (more than 60 in the metro area at the height of the season) and retail stores built around local suppliers, are contributing to the city's booming agriculture scene. Farm supply outlets like hers are supported by residents who are turning their yards, front and back, into productive gardens, as well as raising chickens, goats and the occasional pig. And, of course, all of it adds to the vitality of our local economy, not just as an incubator for small businesses, but in keeping local dollars circulating here and contributing making ours a more vibrant community. On a stretch of NE Simpson just west of Fernhill Park, her farm stand hours are from 10 am till 6 pm on Tuesdays and Fridays. The plan is to build a structure, hopefully before the rains come, on a corner of the large plot that's planned as an extension of The Side Yard Farm. Until then, look for her smiling face under the shed roof, surrounded by the bounty of her neighborhood. Details: The Garden Hose, NE 48th and Simpson. Open Tuesdays and Fridays, 10 am-6 pm. After roasting more than 142 pounds of tomatoes over three days last week, then freezing the resulting 36 quarts, a friend jokingly suggested that I might not be in the mood to help her harvest the bounty of Sungold cherry tomatoes in her garden. "Au contraire, mon cher!" was my snappy comeback. It's that time of year when I want to exhaust my appetite for fresh sliced tomatoes, the better to remember their warm sweetness picked off the vine when I'm mired in the depths of the rain and cold this winter. Sliced thick or thin, eaten au naturel or drizzled with olive oil and a shower of salt, in a caprese or panzanella, sandwiched between slices of Dave's homemade whole wheat bread and a slather of mayonnaise (with or without his home-smoked bacon and a fresh-from-the-garden lettuce leaf) or chopped in chunks and barely warmed before tossing with pasta, you will find tomato juice dribbling down my chin until the last possible moment. 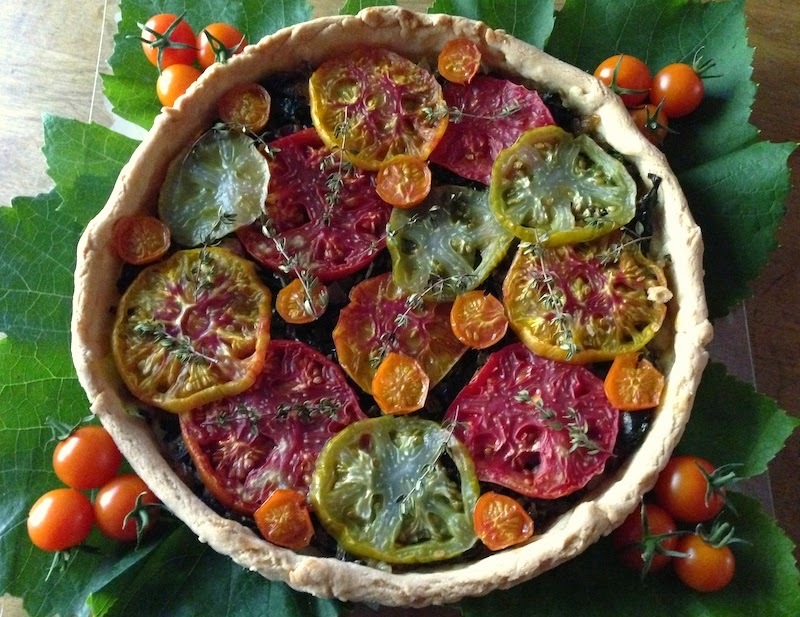 This tomato tart is a particularly fabulous way to enjoy the season, especially with the palette of colorful tomatoes available right now. Enjoy! Put flour and salt in the bowls of a food processor and pulse to combine. Add pieces of butter or margarine and pulse until the texture of cornmeal. With processor running, drizzle in water until it comes together in the bowl. (I usually use 2 1/2 Tbsp. and it comes together well without being too wet.) Remove from bowl, adding in any stray bits, wrap in plastic and refrigerate at least 1/2 hour. Roll out dough on floured surface to make 12" round. Transfer to 9" diameter tart pan with removable bottom. Trim edges, leaving 3/4" overhang. Fold overhang in to form double-thick sides. Press tart edges to raise dough 1/8" above pan. Chill in refrigerator for 30 min. Heat non-stick skillet over medium heat and add bacon. When bacon has rendered, add chopped onion and garlic and sauté till golden, stirring frequently to avoid browning. Add kale chiffonade and sauté till wilted. Remove from heat and set aside. Line inside of crust with foil and bake until golden, about 20 min. Remove from oven and cool slightly. Scatter kale mixture over the bottom of the crust in a thin layer. Top with single layer of tomatoes, arranged randomly. Place in oven and bake for 40 min. or until crust is browned and tomatoes are cooked through. Let cool slightly and remove outer ring from tart pan. Slide tart off bottom onto serving platter, using a spatula if necessary to loosen it. Can be served warm or at room temperature. Walking by a display of vegetables in the farmers' market, most of us glance at the bin, the price and our shopping lists, perhaps sneaking in a squeeze or poke, and move on. Contributor Anthony Boutard of Ayers Creek Farm begs us to pause and appreciate the unique story that each one has to tell. "Ecce Edwardus Ursus scalis nunc tump-tump-tump occipite gradus pulsante post Christophorum Robinum descendens." And so begins the story of Winnie-the-Pooh in the tongue of Virgil and Ovid, as translated by Alexander Lenard (E.P. Dutton 1960) in his Winnie Ille Pu. As hard as it is to imagine anything but a living, vital language telling the tale of a stuffed bear, the faithful were challenged when Vatican II recommended delivering the Mass in the vernacular instead of Latin just five years after its publication. With Latin on the verge of dying, solace was found in the fact that new plant species were still described in Latin. That final bastion of life for the ancient language is now under siege, with some taxonomists proposing the use of English for botanical descriptions. The language of the Mass must deal with love and hate, suffering and bliss, betrayal and redemption. Consequently its Latin is heavily salted with words derived from Greek, a language that handles those subjects well. Latin is the language of laws and strategy. In that respect, it is a fine language for the sciences. Botanical Latin is descriptive and of the present tense. Little need to worry about verbs anyway as the specimen is dry and taped to a herbarium sheet. Nonetheless, the naming of organisms can get a bit litigious. In a form of scientific primogeniture, the person who first publishes an account correctly describing and naming a plant prevails, no matter how wonderful, familiar, pertinent or worthy subsequent names are. So there is a breed of scientists who make it their life's work to shake up the existing order. Jean-Baptiste Pierre Antoine de Monet, Chevalier de Lamarck. Such is the case of the tomatillo. The great French scientist, Jean-Baptiste Pierre Antoine de Monet, Chevalier de Lamarck published a description of the plant, naming it Physalis pennsylvanica. His Portuguese contemporary, Félix de Avelar Brotero, gave it the name Physalis ixocarpa at approximately the same time. Both names have been used over time, but Brotero was a nose too late in the opinion of the modern publications department. So this lovely fruit, essential to Central American cooking and largely ignored in the Northeastern United States, is named after a state where it has no substantive connection. With such a fancy name, you would think the Chevalier would have been a bit more creative. An essential part of Mexican cooking is stuck with the name of the cheesesteak's home. Brotero's epithet, ixocarpa, on the other hand, is an intriguing fusion of Greek and Latin. Most cookbook authors and gardeners dully repeat that it means "sticky fruit" without further inquiry. In Latin, carpa means fruit, that's true. The ixo is a bit more of a puzzle. In neither Latin nor Greek does it correspond to the word "sticky." In fact, the letter x is not a Roman letter per se; it is a number. In our alphabet, it can represent one of two Greek letters, xi or chi. Brotero's x works both ways. Using the Greek character xi, it is the prefix to a complex of words referring to birdlime. This sticky substance was rendered from the bark of holly or the berries of mistletoe and smeared on the branch of trees where birds roosted. They were then captured by the likes of Mozart's bird catcher, Papageno, and sold for food or ornament. The name comes obliquely to sticky, but arrives well. 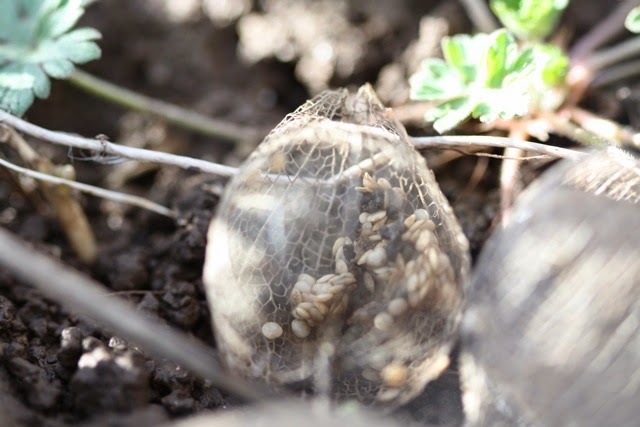 The desiccated husk forms a basket to hold the seeds. If we treat it as the character chi instead, the word is a prefix to a complex of words referring to fish, notably dried fish skin, or a basket for carrying fish or trapping fish. 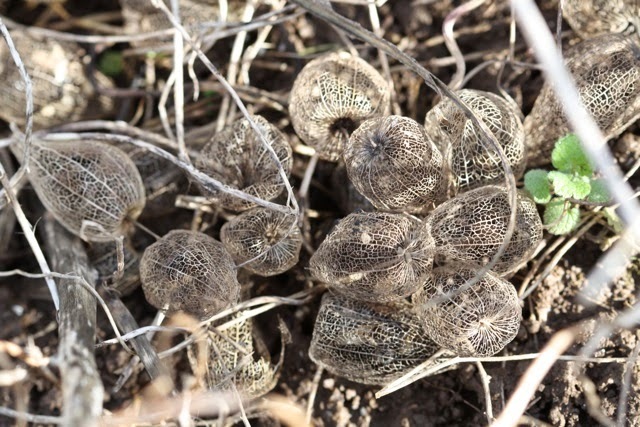 The husk is certainly reminiscent of dried fish skin, and when the soft tissue of the husk and fruit rot away, leaving just the vascular tissue, it forms a basket containing the seeds that look just like so many fish in a carrying basket or fish trap. The wind blows these little baskets around the farm and, as they roll about, the seeds drop out bit by bit. The husk develops from the base of the sepals. 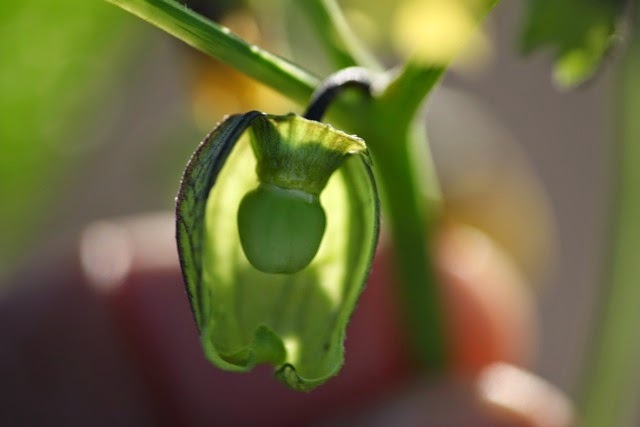 When the flower is pollinated, the yellow petals fall off and a special growth tissue, or meristem, at the base of the sepals starts to grow. 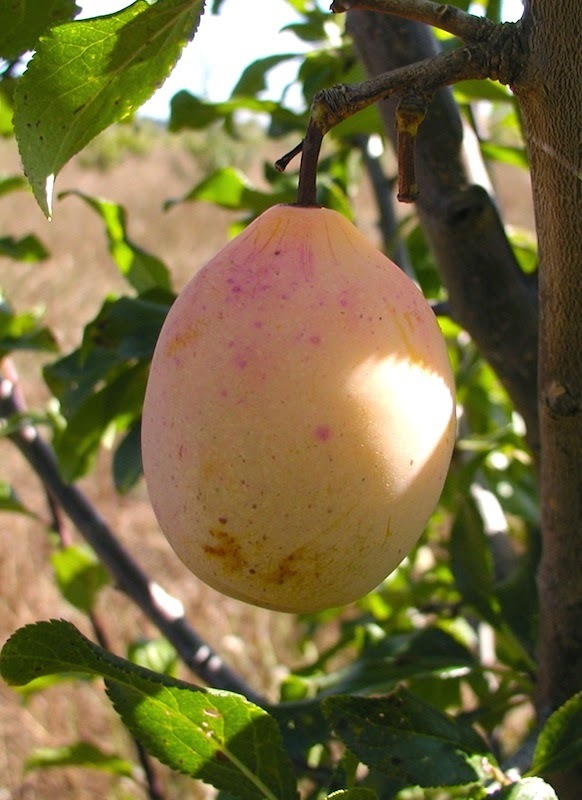 It keeps pace with the developing fruit inside until just before ripening. The ripe fruit tears through the husk, at which point it is ripe. Zenón refers to it as taking its shirt off, and that is when they are best harvested. If they fall to the ground, they are deemed ripe as well. As he puts it, the fruit is essentially sharp-flavored, but it should have a distinct sweetness alongside the acidity. The dried husks distribute seeds. 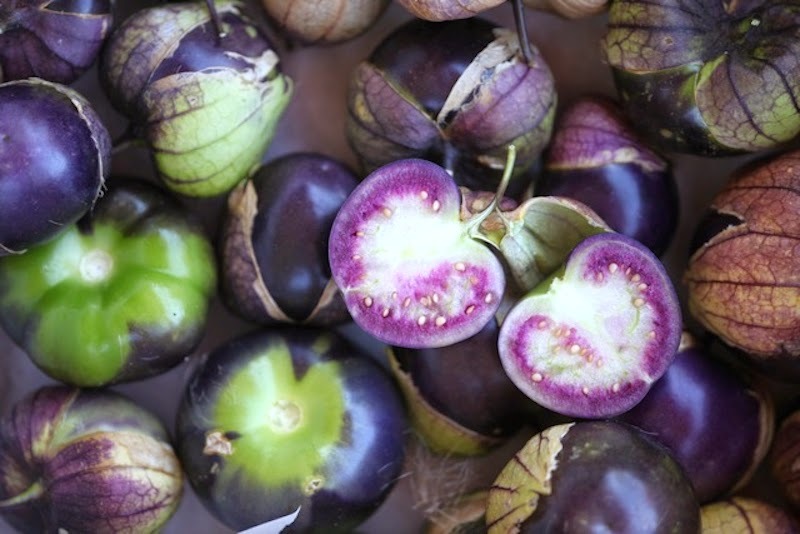 Having tried the Brand X tomatillos and being fundamentally New Englanders, we were leery of the fruit initially. 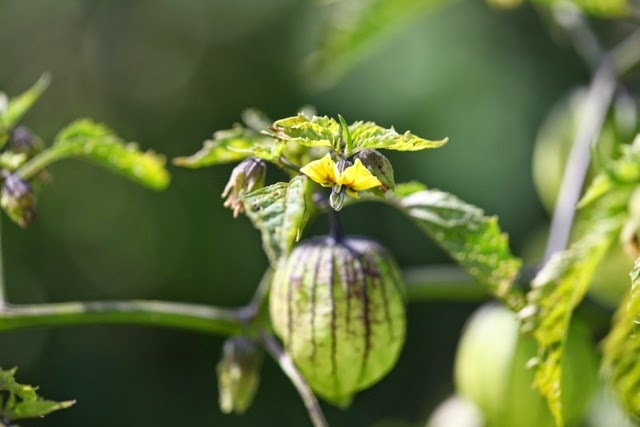 With staff's expert guidance, we now feel comfortable with tomatillos. For sauces, we use tomatillos both raw and cooked. They are a basic ingredient in a pozole verde, and we roast them with other vegetables. Staff have a strong preference for the purple types which are more flavorful. That's helped assuage our leeriness as well. They also taught us to keep the fruits in a dry place, where they will last in good shape until March. 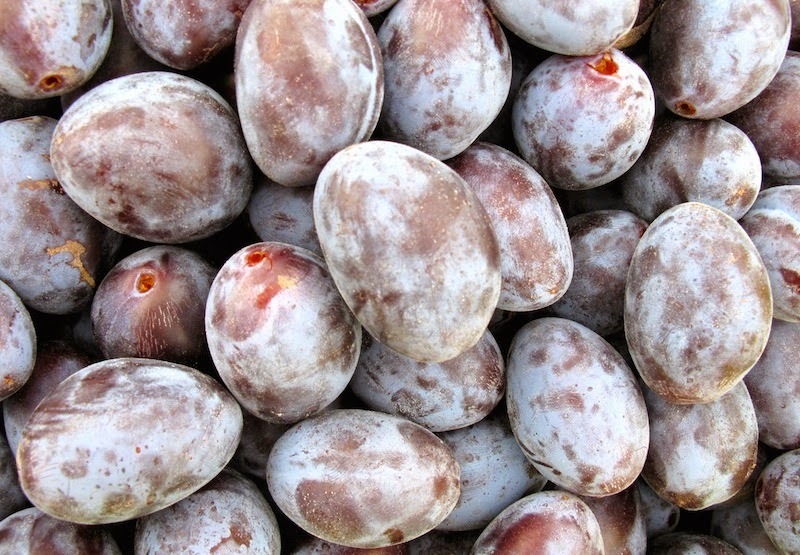 In fact, purple fruits that last until March are the two primary selection criteria for seed production. 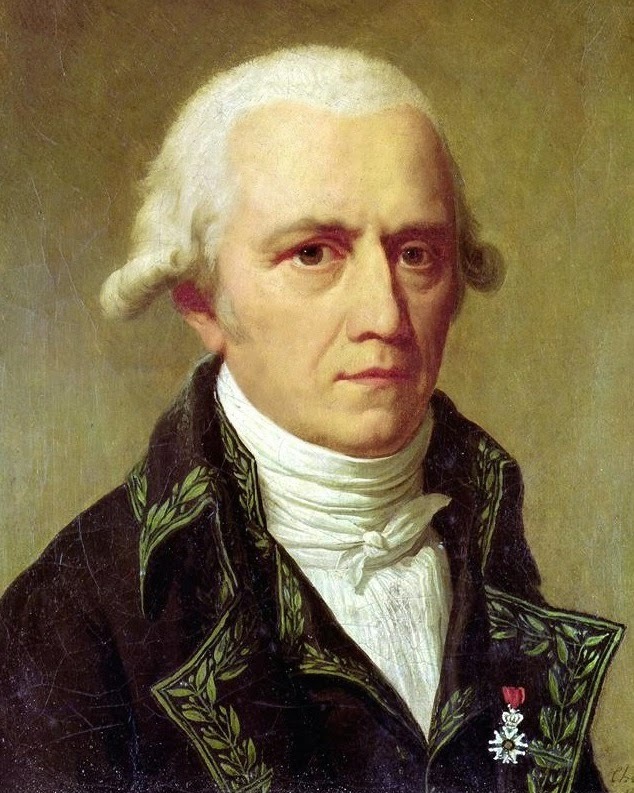 Both born in 1744, Lamarck and Brotero contributed a great deal to science. Lamarck is worth a special note because he was one of the earliest scientists to question the immutability of species, and suggest that organisms could change over time, a process later called evolution. His proposed mechanism was mocked and ultimately dismissed in favor of Darwin's theory of natural selection. As we understand the evolutionary process better, Lamarck's ideas have gained greater respect. Nonetheless, he will still have the albatross of naming a great Mexican fruit after the American cheesesteak capitol hanging around his neck. Are Hungarians always happy? They would be if they're having this lovely plum cake, especially with a cup of their national drink, which is, according to ItsHungarian, "a strong mocha with a high level of caffeine, a kind of Italian espresso, which is called kávé, presszókávé, or fekete (strong black coffee)." The reason for making this cake, other than it's cake, is that our friends J&K were having a movie night featuring The Grand Budapest Hotel, Wes Anderson's kitschy but charming ode to the stories of Austrian novelist Stefan Zweig. Movie night is always accompanied by a dinner that is more-or-less themed to go with the movie. This one was to be a potluck featuring a Hungarian chicken paprikash as the main course, and since dessert is one of the toughest dishes to make Dave-safe, I volunteered to bring that. With plums at their peak this time of year, a cake, tart or crostata of some sort seemed in order. 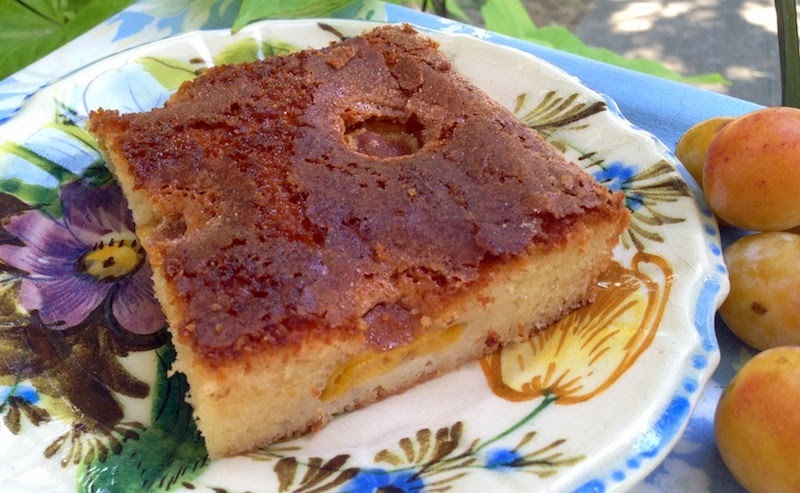 Thumbing through cookbooks and websites turned up a slew of traditional Hungarian plum cakes (who knew?) that could be adapted to be lactose-free yet still satisfying for those of us fortunate enough to be lactose tolerant. I was making a trip to the Hillsdale Farmers' Market anyway, and I knew that Anthony and Carol would have a good selection of plums from their organic orchard at Ayers Creek Farm. Sampling what they hand brought that week, I fell in love with the perfumey, sweet flavor of the delicately blushing mirabelles and bought a couple of dozen. Needless to say, the cake was beautiful and a hit with the movie-viewing crew. 1 3/4 c. sugar, plus addt'l. 2 Tbsp. In a medium mixing bowl, combine the flour, baking powder and salt in a bowl. In a large mixing bowl, whisk 1 3/4 c. sugar and the eggs together until smooth. Stir in milk, oil and vanilla. Add flour mixture and stir to combine until it becomes a smooth batter. Pour the batter into the prepared baking pan. Arrange the plum halves, cut sides down, evenly over batter. Combine remaining 2 Tbsp. sugar with the cinnamon in a bowl and sprinkle over the top of the batter. Bake until a toothpick inserted into the middle of the cake comes out clean, 50 min.-1 hr. * This recipe can be halved and baked in a 9-inch by 12-inch baking pan. 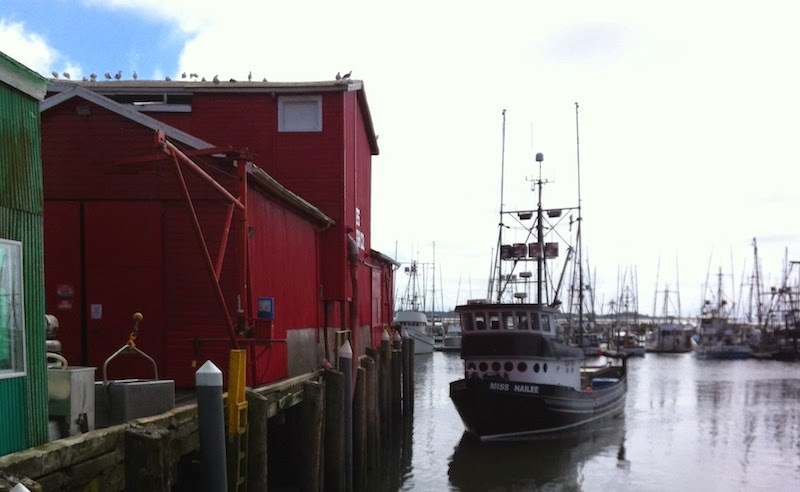 Fishing boat in Ilwaco, WA. As I've stated here many times, lumping all tuna into one full-of-mercury category is wrong from both a health and a factual standpoint. And yes, I know, parsing complicated issues when speaking to the public is difficult, but facts are facts, and fear-mongering headlines negatively impact thousands of fishing families in Oregon and Washington and hundreds of coastal communities that depend on the fishing industry for their survival. "The U.S. albacore troll/pole fleet is a small boat fleet of hook and line vessels generally 35-75 ft. in length, that are family-owned and operated and fish for albacore tuna from July through October off the west coast, mainly Oregon and Washington. The fishery is certified by Marine Stewardship Council (MSC) as sustainable and well managed and also appears on the "Green" list from the Monterey Bay Aquarium Seafood Watch. Our fleet lands on average 30,000,000 pounds each year with about half exported to Europe and Asia. 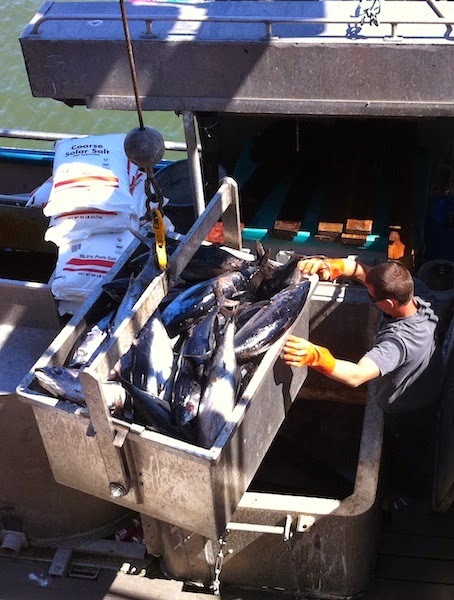 The fleet catches 2 to 4-year-old albacore (10-25 pounds) with an average of about 13 pounds year after year. Extensive mercury testing has been [done] over the last 10 years through Oregon State University as well as by buyers and exporters. All recent mercury testing has shown very small levels of Hg [mercury] in the fish well below FDA standards of 1.0 ppm and well below Canadian guidelines of .5 ppm (The Canadian government has recently removed their 'no eat' recommendation from their local troll albacore caught off the U.S. and Canada.)" 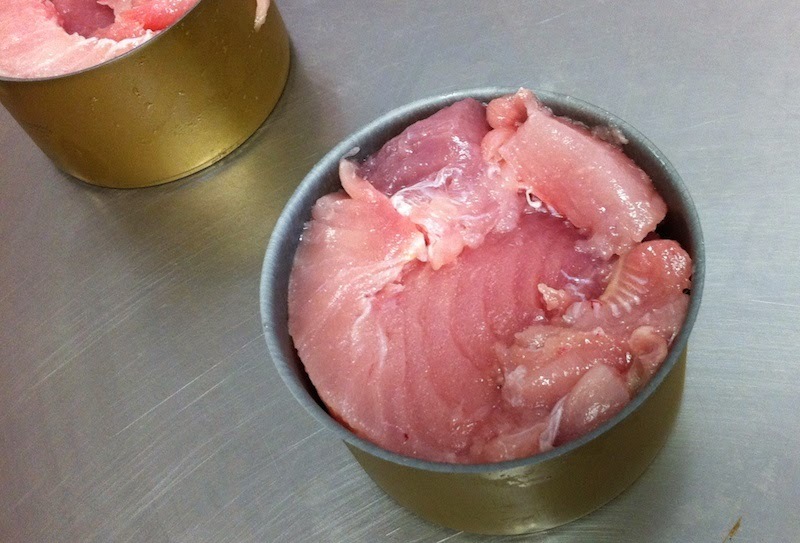 Fresh-packed West Coast albacore tuna. What should you do when you go to the store to shop for tuna? First, look for the blue MSC label or, better yet, read the fine print on the label. The only ingredient should be albacore tuna—though some also add salt—because it's fresh-packed, so the fish cooks in its own juices (left) eliminating the need for added oil or water. If it has oil or water, it's almost guaranteed to come from large fishing vessels that ply the deep southern Pacific ocean. These gigantic vessels catch older, much larger albacore that have lived for years in the mercury-polluted ocean waters (a whole outrage on its own). Good local brands to look for are Sweet Creek processed by Paul and Judy Fuller in Elmira, Oregon; Sacred Sea from the Goché family in Coquille; and Skipanon from the Kujala family of Warrenton. Top photo from Wild Pacific Albacore. 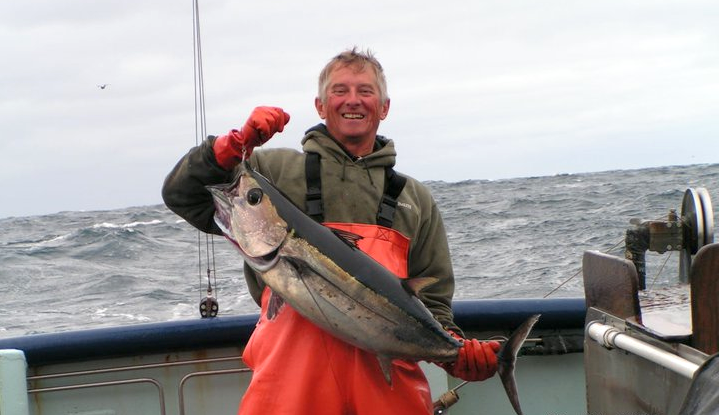 Read my article on the Oregon albacore fishery, which goes into more detail about how albacore is caught and processed.